I have taken a neglected allotment site, I am told it is a 1/4 allotment approx. 65m2. - Shall I get a Shed or a GH? 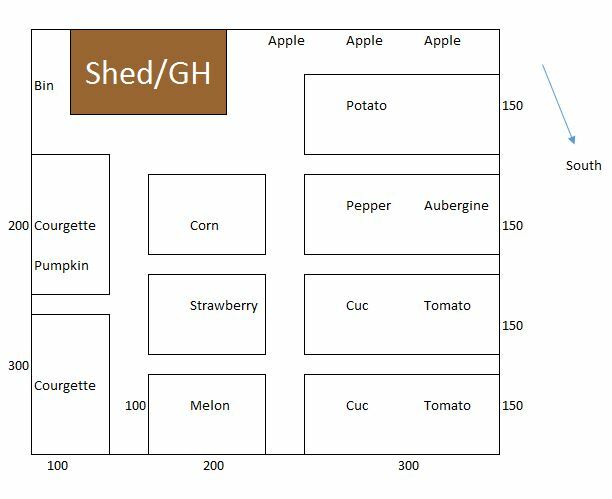 Shed or GH must be 6x4. - Will I need polytunnels etc, I see quite a few people protected their crops with nets. Congrats on your new plot! You want to grow a lot of veg that tend to do better in a GH or poly - toms, aubergines, peppers, melons. Choose your varieties carefully, to maximise your chances. Snoop Puss, Scarlet, Gillykat and 1 others like this. How close is your plot to your house? what is the security like on the plot? I would generally think a greenhouse will be used for lots of things that need regular attention. I'm lucky enough to have space at home for a greenhouse and a shed on the plot. If you have space at home for you greenhouse I'd do that. The other drawback of a greenhouse on the plot is the lack of security in terms of broken panes (by accident or vandalism) and the fact it's not a secure place to keep things like tools out of sight. (this isn't to say a shed is super-secure, but it is a bit more secure). One compromise might be to put a tool chest inside the greenhouse (but you will end up finding it covered in seedlings when you want to put tools away). Hi, as VC says, congrats on getting your plot. Your plan looks OK to me apart from the apple trees, which are maybe a bit close. Other people more knowledgeable than me about apple trees might be able to comment more on that. Apart from the strawberries, I'm not sure that anything you're proposing to grow will need netting. How many courgette plants are you proposing to grow? They're very productive and you might find yourself with more courgettes than you can eat or even give away. And have you thought about what you might want to grow next year? The usual advice is avoid growing the same thing in the same spot two years running. Will you simply swap things over from one side of your plot to the other? Best wishes for a great growing year. Scarlet and Selymbria like this. Maybe the apples are cordon? but in any case I hope they won't shade the next plot too much, as that can cause friction with plot neighbours. Here we aren't allowed to grow anything taller than 7ft, so check your rules. The aubergines/tomatoes/peppers will be much better grown in a greenhouse or under tall plastic cloches, weather and blight make them difficult to grow uncovered. You could save ground space by growing your cucumbers up trellis or wigwams, with their tendrils they usually twine ok with just a little tying in. Tomato/pepper/aubergine/potato are all within the same vegetable family, so you can't grow these in the same beds next year, you'd need to move them all to the left-hand side. Beds are wide at 1500mm, I find it a stretch at 1200mm and I'm 5ft8" make sure paths are min 600 or measure from toe to knee when on the ground so that you don't have to plant at an angle which can be murder on the body. Snadger, Scarlet, Mr Bones and 2 others like this. I've built myself a combined GH-Shed in one part of my garden - which has a shared wall and a connecting door - it makes good use of the space for me, and as I was using my own materials etc and building from scratch I was able to make it to fit the available space. Hi and welcome to the vine. It doesn't have to be an expensive bought one, I know, because I built a similar one out of scrap wood and windows. I agree with Cad about the beds width being to wide as the whole idea is you never walk on the beds and do all the planting etc from the paths. One other suggestion is that if you are adamant you want beds, don't put surrounds on them the first year as as sure as God made little apples you will change the bed positions the second year. Snoop Puss, Scarlet, Mr Bones and 2 others like this.